They are made of a recycled angora/wool bulky yarn which I’ve dyed to 3 colors; a bright yellow, light turquoise and dark blue. They are going to be so very cushy and wonderful!! One problem, though, is I don’t think I’ll have enough yellow yarn to do both sides of a pillow… I have more of the turquoise and blue, however. I’m sure I’ll manage to improvise something, with the size of my stash being what it is…. I’m making up the design up as I go; working a square from the centre out by increasing at 4 points every round. I added a section of seed stitch, which is very attractive in a bulky yarn, and a *yo, P2tog* lacey insert, which creates a very nice little row of dense little ‘purls’, and I recommend trying! This one is almost finished now; a few more rounds and I’ll bind off and start the next. 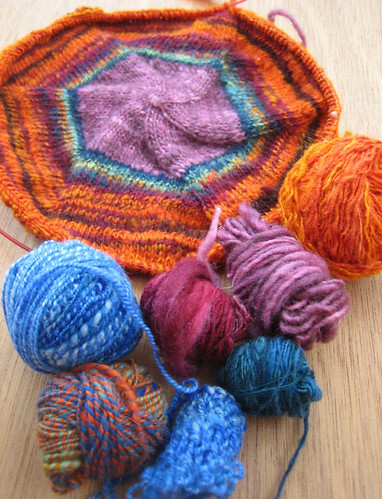 It’s very fast and satisfying knitting, as it grows so quickly! It is very bulky, and I’m curious to see whether it changes a lot or not very much with blocking; because I seldom knit with this bulky of yarn. On this spindles, I’ve got some new fibre; alpaca with a bit of wool, which I bought during a visit to Saltspring Island this last weekend, at lovely farm called Bullock Lake Farm. They raise sheep, angora goats (which produce mohair), alpacas, llamas, and have many other creatures. It was an lovely place to visit. I’ll get some pictures of the first bit of spun yarn up soon; it’ll be interesting to learn how best to spin the alpaca; and what kind of yarn best utilizes it’s qualities. After putting the project aside for some time, I had gotten to the point where I was ready to rip it back (it was too big… :( ), and so I did that on Friday night, and then started knitting on it again on the ferry over to Saltspring on Saturday. Then Sunday morning, I realized… &@#$^%!!! it was STILL too big. So I ripped again, farther back this time. 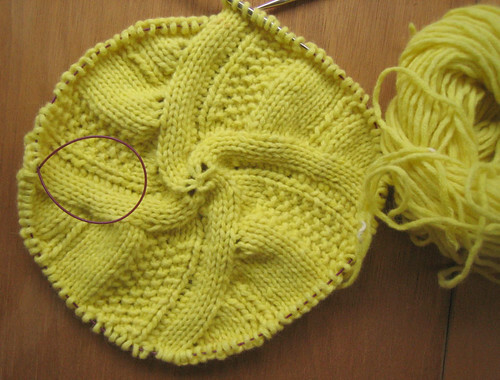 I think there’s just something about the way I increased; every round, in 6 places… that makes it just balloon, even after I start knitting completely straight. But it IS beautiful, in the sort of way that kind of hurts your eyes with its clashiness! Well I’m farther along now than is shown in the picture, and it STILL seems like it’ll be a bit too big, but there’s no way I’m going to rip it out again; if it doesn’t fit quite right when it’s finished, I’ll just felt it to size.